China Unicom, the nation's second largest cell phone carrier, said on Friday it expects nearly 10 percent of the third generation (3G) users in the country to switch to Apple Inc's iPhone in the next couple of years. Tian Wenke, general manager of corporate business department of China Unicom, told China Daily that the smartphone has already evoked good interest from business users. "We expect nearly 10 percent of China's 3G users to buy iPhones," Tian said at an industry forum in Hangzhou. The number of 3G users in the country is expected to reach 16.2 million by the end of next year, according to figures from research firm Wireless Intelligence. Li Yizhong, minister of the industry and information technology, had earlier said China plans to have around 240 million 3G users by 2012. 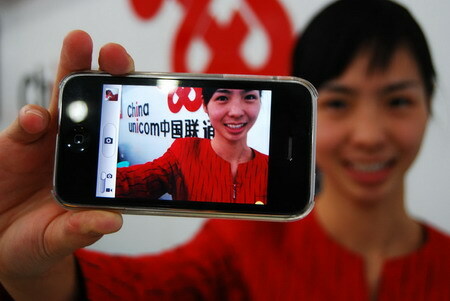 On Tuesday China Unicom Chairman Chang Xiaobing said he expects iPhone to become China's best-selling smartphone. Unicom was reported to have sold fewer iPhones than analysts' expectations after its debut last month, raising concerns that the high prices may deter customers from buying the smartphone. Tian, however, dismissed such charges. He said the pricing of the phone is "very reasonable for those who spend heavily on their phone bills every month". According to the company, an iPhone without a service contract costs as much as 6,999 yuan ($1,025) in China, compared with $299 in the United States. The product will be free when customers select a two-year service plan that costs 886 yuan per month. The company had signed up only 5,000 iPhone users after the first two days of its debut last month. In comparison, nearly 1 million units of the smartphone were sold in the first three days when the latest model was launched in North America and Europe in June. China Unicom also feels that if it were to price the iPhone lower, then users would buy the handset, but run it on the network of its rival carrier China Mobile, which has a nearly 70 percent share of China's mobile market. Many Chinese users are hesitant to subscribe to China Unicom, as they want to retain their original phone numbers, which is not transferable, according to the current regulation. An analyst from one of the world's biggest market trackers feels that sales of iPhone are expected to touch 60,000 to 70,000 in China this month. He expects iPhone to account for nearly 5 percent of China's smartphone market by next year. "But the product's further growth will be largely limited due to China Unicom's high pricing," said the analyst, who declined to be named. Wang Yuquan, a senior consultant from research firm Frost & Sullivan, said Unicom's pricing of iPhone is too high even for business users in China. He said such a pricing strategy, as well as lack of WiFi function, would spur grey market sales of iPhone in the country currently estimated at around 2 million units. Since its debut in 2007, iPhone now has a 17.1 percent share of the global smartphone market in the third quarter of this year, according to research firm Gartner. That makes it the third largest cellphone provider after Nokia and Blackberry maker Research In Motion (RIM). China Unicom had 1.02 million 3G subscribers as of the end of October, the company's Hong Kong-listed arm said in a regulatory filing on Nov 19.